Kofta is a Middle Eastern and South Asian meatball or dumpling. 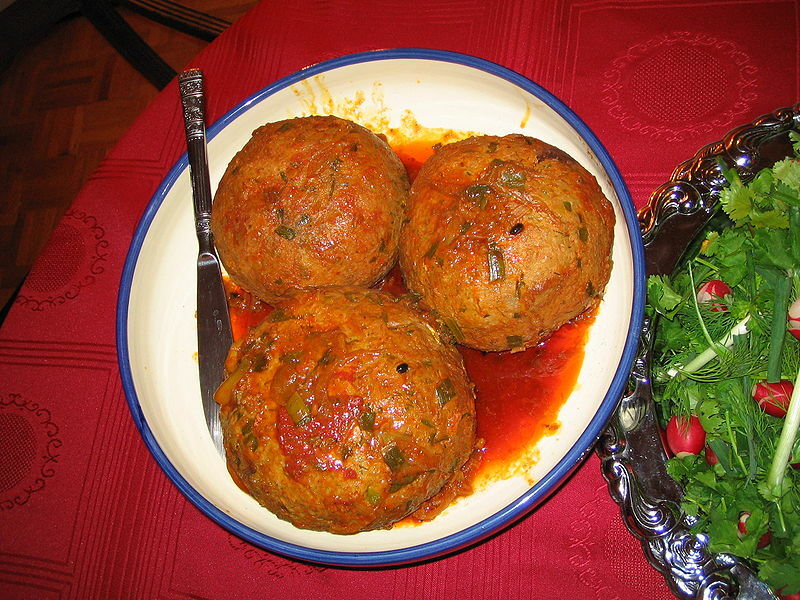 The word kofta is derived from Persian kūfta. In Persian, کوفتن (Kuftan) means "to beat" or "to grind" or meatball. In the simplest form, koftas consist of balls of minced or ground meat — usually beef or lamb — mixed with spices and/or onions. The vegetarian variety like lauki kofta, shahi aloo kofta are popular in India. The meat is often mixed with other ingredients such as rice, Bulgur, vegetables, or eggs to form a smooth paste. Koftas are sometimes made with fish or vegetables rather than meat, especially in India. They can be grilled, fried, steamed, poached, baked or marinated, and may be served with a rich spicy sauce. Variations occur in North Africa, the Mediterranean, Central Europe, Asia and India. There are nearly 300 different kinds of kofta in Turkey, where it is very popular. In Arab countries, kufta is usually shaped into cigar-shaped cylinders. Early recipes (included in some of the earliest known Arabic cookbooks) generally concern seasoned lamb rolled into orange-sized balls, and glazed with egg yolk and sometimes saffron. This method was taken to the west and is referred to as gilding, or endoring. Many regional variations exist, notable among them the unusually large Iranian Kufteh Tabrizi (see the photo above), having an average diameter of 20cm (8"). Koftas in South Asian cuisine are normally cooked in a spicy curry and sometimes with whole pre-boiled eggs. Sometimes the eggs are encased in a layer of the spicy kofta meat so that the final product resembles an Indian Scotch egg. These kofta dishes are very popular with South Asian families and are widely available from many Indian restaurants. In Bengal, a region of East India, koftas are made with prawns, fish, green bananas, cabbage, as well as minced goat meat.